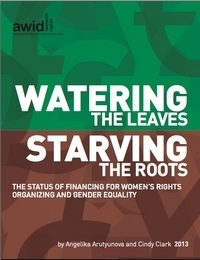 The new report by Hivos partner AWID, ‘Watering the Leaves, Starving the Roots’, provides the latest analysis on the funding trends impacting women’s rights organising and the financial status of women’s organisations around the world. The work of authors Angelika Arutyunova and Cindy Clark aims to help women’s rights organisations and their funder allies make sense of the rapidly changing funding landscape and adapt their resource mobilisation and distribution strategies accordingly. The analysis is based on a survey of over 1,100 women’s organisations around the world. The report identifies three major trends which have made the funding landscape more diverse and complex over the last few years because of the increasing diversity of actors and agendas involved. The trends among traditional funder allies, bilateral agencies and international NGOs present a mixed picture. The impact of the financial crisis on development cooperation has led to budget cuts affecting overall levels of bilateral funding. However, for a few countries, including the Netherlands, this has not yet affected the funding for women’s rights and gender equality organising. International NGOs have become less prominent funders thanks to budget cuts and new priorities in terms of own programming. The authors specifically highlight the impact of the reduced resources available to Dutch NGOs. This is important as Hivos, Cordaid and Oxfam Novib are three of the top five most important international NGOs mentioned in this latest AWID survey. Hivos has supported AWID since 2003 and we have successfully worked together on resource mobilisation for women’s rights and gender equality. Our collaboration contributed to the establishment of the Dutch government MDG3 Fund and its current successor Funding Leadership Opportunities for Women (FLOW).